It’s time to highlight one of the stars of California Syrah. Steve Edmunds has been around for a long time in California and he’s always made wines in a rather low alcohol, “European” style. He never succumbed to the big, rich, oak influenced (read Parkerized) craze of the mid 90s and mid 2000s. He therefore missed out on perhaps a decade of publicity. As the pendulum seems to be swinging back toward a more terroir-driven style of Syrah, Edmunds St. John enjoys favor among the cognoscenti. 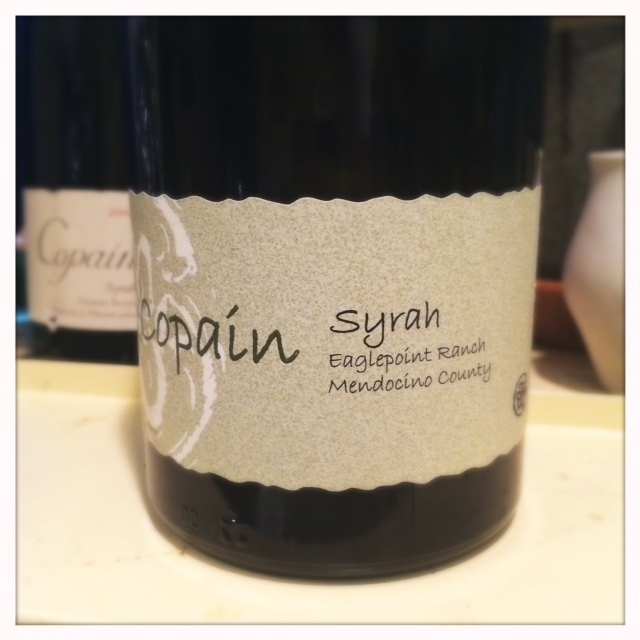 For followers of Syrah in the New World though, Steve Edmunds’ Syrahs never really went away, they’ve always been wines to enjoy for their pure, unadulterated character. 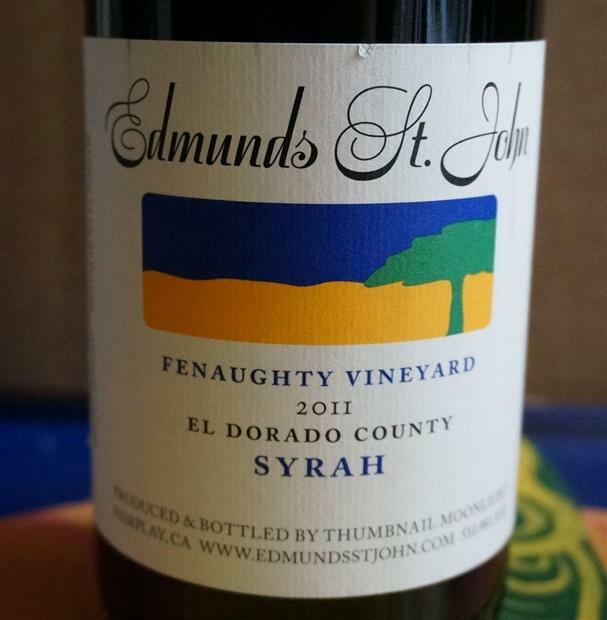 Edmunds makes wines from the Sierra foothills (among other areas) and the truth is that it’s been a little hard for me to put a finger on Syrah from this appellation. Sometimes it seems cool-climate and sometimes it seems to produce rather big and bulky styles of Syrah. In fact, some of the biggest Syrahs I’ve ever tasted have been from this region. Luckily with Steve’s wines I don’t have to worry about that dichotomy, he prides himself on letting the vineyard speak for itself and his grapes are picked at a time that retains their freshness and, once fermented, they aren’t subjected to any new oak. The wine: Green peppercorn on the nose with some blackberry, plum, and honeysuckle aromas in the background but that peppercorn is unmistakable. It’s a warm and inviting smell for me because it invokes memories of mom’s cooking and home. This wine definitely benefits from time open in the bottle, like all cool-climate Syrah. It seemed a little thin yesterday after first opening but after a day on the counter the mid-palate had really fleshed out and the finish is less abrupt and more full. The tannins are in control and the acidity is present but nicely integrated. The finish tastes of strawberries and balsamic. A really delicious wine that makes me feel very happy and privileged to taste it. By the way, if you’d like to learn even more about Steve Edmunds, perhaps more than you ever wanted to know, check out Levi Dalton’s excellent podcast. 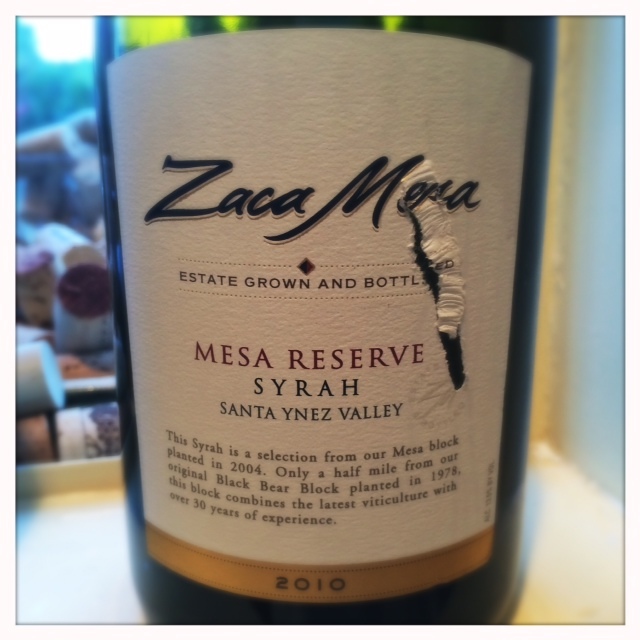 If you are into Syrah in California, you have undoubtedly heard of Zaca Mesa. It’s been around forever and has, in fact, the oldest Syrah plantings in Santa Barbara (1978). Located in Santa Barbara County near the town of Los Olivos, it’s not exactly cool-climate but it does benefit from cooling breezes off the coast. Two of Syrah’s biggest proponents in CA worked at Zaca Mesa in the early years, Adam Tolmach of Ojai and Bob Lindquist of Qupé. As a cool climate aficionado, I’ll admit that Zaca Mesa wasn’t on my radar. I was intrigued to see that all the wines they sent me to sample were under 14% alcohol (The Chapel G’s label read 14.5% but the winery assured me that was actually a labeling mistake and should read 13.8%). These are wines that I had thought of as being pretty big versions of Syrah but I was happy to have those assumptions challenged. 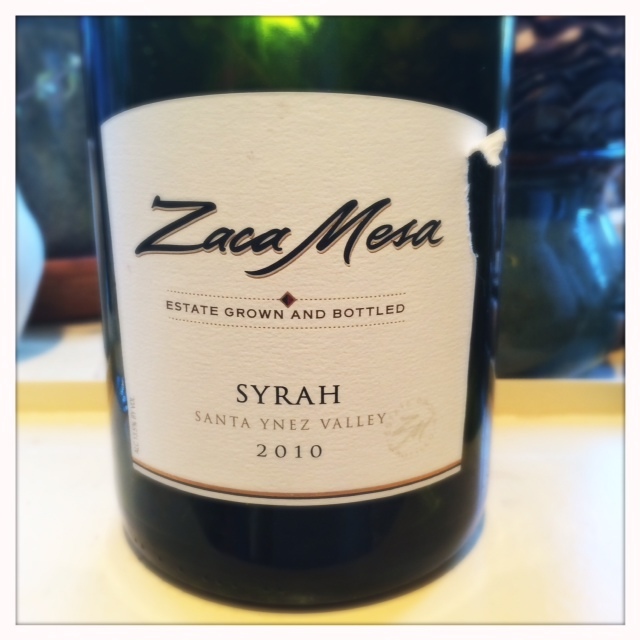 Santa Ynez Valley 2010 Syrah is Zaca Mesa’s least expensive Syrah and is made from a combination of Estate vineyards in Santa Ynez. It’s a Syrah that’s on many restaurant lists across the country. I’ve had it before and haven’t found it very interesting but I was intrigued that the 2010 vintage has an alcohol level under 14%. It’s a pretty big Syrah with a vanilla and berry nose and a slightly candied finish. I also got some rich plum flavor. The mid-palate has good acidity and the blackberry flavors carry through. It’s a big, full wine but it isn’t overblown. If you see the 2010 on any lists, it’s definitely an option to consider. The 2011 Chapel G was my favorite wine of the bunch. It has great acidity and elegance with high toned, red-fruit aromas and a hint of something vegetal in the background. The tannins are sweet but present. This is a quality cool-climate style Syrah. It has some savory aromas but really showcases a pure, bright fruit aroma and a full, big, but not too oaky palate. I believe it really did come it at under 14% alcohol. The 2010 Mesa Reserve was my least favorite of the three. It’s a style of Syrah that fits the “Syrah only goes with BBQ ribs” stereotype (to be fair, it probably would be pretty darn good with ribs slathered with sauce). It’s not my style, the oak is simply too present. It’s more of a creamy, vanilla style Syrah with a strawberry finish. I sense some beautiful fresh fruit flavors and some savory elements but it’s hard to parse them out. This wine sees 62% new oak, so you can see where the oak influence comes from. Interestingly, when I opened these wines with a couple of other friends who enjoy wine but are not obsessed like me, the Mesa Reserve was the crowd favorite. It does have a smoothness and ease of drinking that could appeal to the casual drinker. 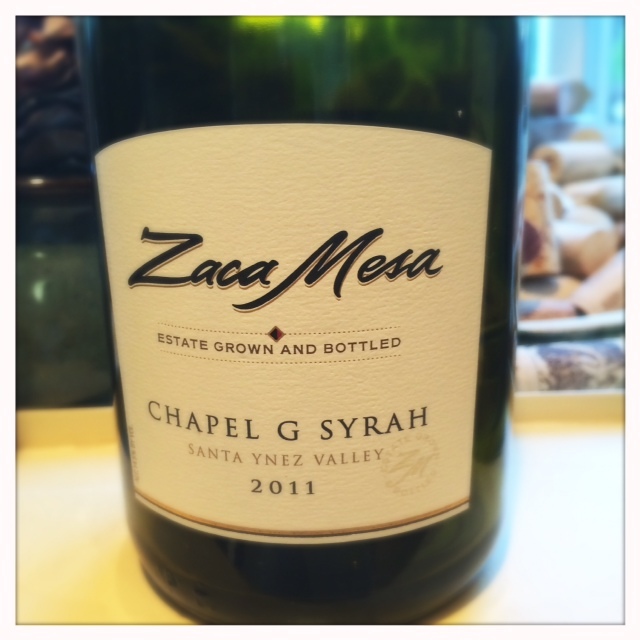 It was a pleasure to try them all and I think the Chapel G (which is a new vineyard designate for Zaca Mesa) is a wine for Syrah aficionados to seek out. And I’ll definitely consider a Santa Ynez Syrah the next time I see it by the glass on a restaurant list. These wines were provided from the winery as samples for review. I was able to get hold of a few older Copain wines from K and L the other day and I thought it would be interesting to see how they are holding up. 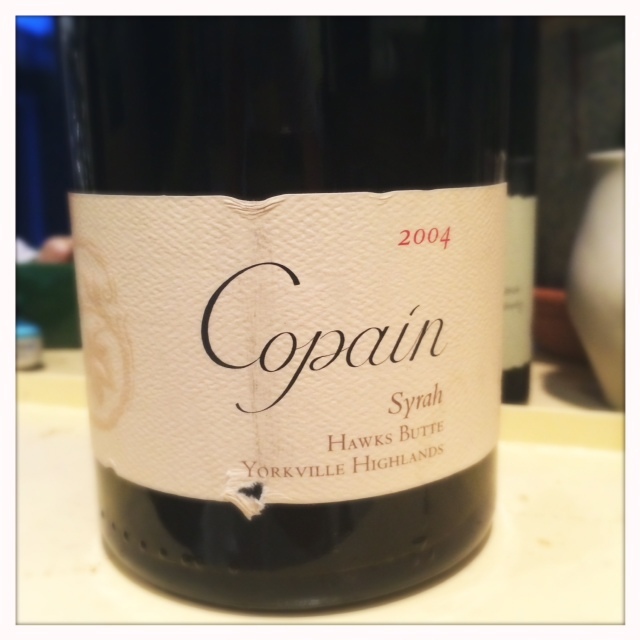 The winemaker for Copain, Wells Guthrie, had something of a change of heart in the mid 2000s resulting in a subsequent change in the level of ripeness in his wines. I wanted to see how the wines were holding up, especially after my tasting with Fred Swan in which we tasted the 2002 Broken Leg and the 2002 Eaglepoint Ranch. I thought then that they were holding up well. Yes, they had a higher level of alcohol (around 14.5%) than his current wines but they weren’t overly ripe by any means. In fact, I thought they were rather fresh and structured for ten year old wines. The following wines were tasted over a period of a few days. On first opening this Syrah was completely closed down and for a second I thought it was corked because of the lack of aromatics. But the wine opened up and, although still not exactly super expressive on the nose, it’s got a rich mid-palate, not jammy but a little stewy, not exactly a fresh fruit profile. I did get some aromas of blackberry, dust, oak and milky vanilla. This is not the balanced, elegant style of Syrah that Copain is known for nowadays or, after a decade of age, it’s not showing that way. It’s got very present oak and a glycerine richness that I wouldn’t expect from a Wells Guthrie wine of the present. There’s a tad bit of alcohol coming through on the finish also. I can sense a balanced wine in there somewhere but it’s not quite there in the 2004 version of the wine. It makes me wonder if this is what Guthrie noticed when he tasted through his wines and had the epiphany to change his style to a more “old world” Syrah style. If it was, then I think he made the right choice because this wine just doesn’t have the structure and freshness that I would have expected and the oak is simply too present. This wine is definitely more balanced than the Hawks Butte. It has a text book cool-climate kalamata olive character mixed with some nice floral and meaty aromas. Yes, there’s some blackberry, bright cherry and salty plum fruit there but it’s in the background and it’s the savory aromas that really take center stage. The mid-palate has some nice juicy acidity and the tannins are relative smooth in the background. This is a wine that begs for cheese or salty snacks. It’s my style of Syrah and again makes me wonder what happened to Eaglepoint vineyard and why there are very few vineyard designate Syrahs coming out of there. It’s hard to make a generalization based on two bottles of wine from different vineyards but it’s easy to imagine that Guthrie saw that the mid 2000 versions of his Syrahs simply weren’t holding up well over time. Newer vintages of Guthrie’s Syrahs are coming in under 13% ABV so you can see that he made a substantial shift in style. I also question how much new oak was used on the either the 2001 or the 2004 and how much that affected the structure of the wine over time for these two bottles. I would guess the 2004 Syrah saw more new oak. It could also be that the natural acidity of the Eaglepoint Ranch wine that gave it more structure and cool climate character. As seems typical with wine, after tasting these vintages more questions were raised than answered. These wines were sold back to K and L by a private party from a personal collection. It was a rare opportunity to taste the older vintage Syrahs and I’m glad I pulled the trigger when they popped up.